A stunning series of new photos of the surface of Mars have been released by the team of scientists responsible for the High Resolution Imaging Science Experiment camera (HiRISE) aboard the Mars Reconnaissance Orbiter. It is one of a series of instruments created by NASA’s Jet Propulsion Laboratory and the University of Arizona to study the Martian planet. Together, the instruments are able to: "zoom in for close-up photography of the martian surface, analyze minerals, look for subsurface water, trace how much dust and water are distributed in the atmosphere and monitor daily global weather." HiRISE uses advanced technology which creates “false-colour” images, which enables viewers to see features more clearly, including small details which would not be visible in black and white. It is often used to understand deep space phenomena like supernovas or nebulae. The technique takes pictures in three colour bands – blue/green, red and infrared which are then adjusted to take into account the visible spectrum of the human eye. The different colours help to identify certain aspects of topography. For example, dust looks reddish in colour, while coarser-grained materials like sand and rocks are bluer. Frost and ice also have a bluish tone but brighter. 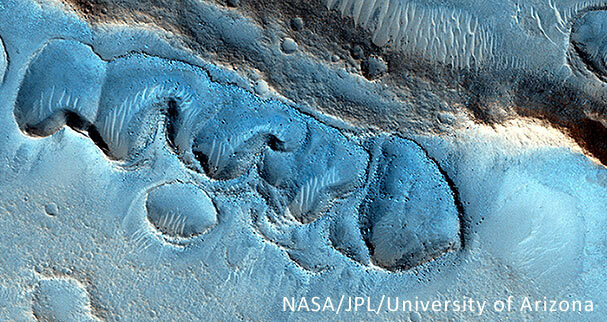 Click here to view the incredible photos of the Martian landscape.